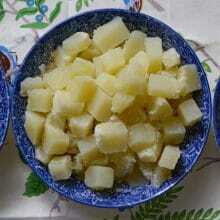 Like talami dough, the dough for fatayar is different than standard bread dough. 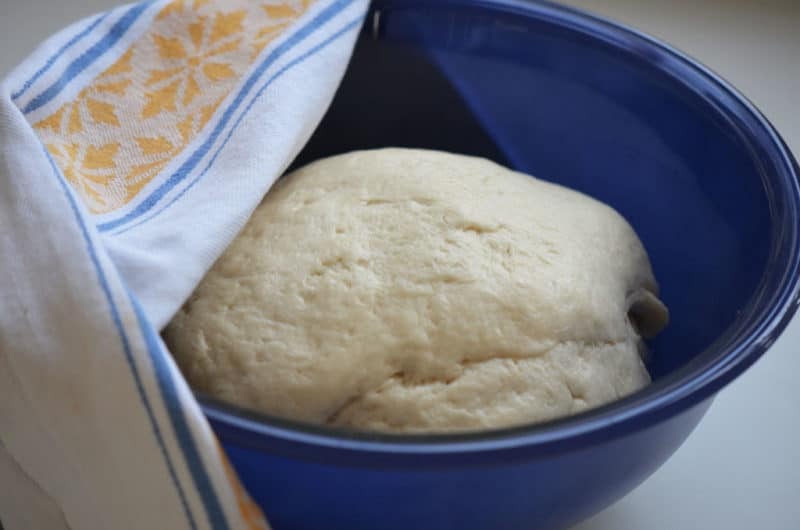 This dough is not nearly as wet as talami dough, but it is a sticky dough that takes just one rise (typically bread-baking is a two-rise process). The sticky factor is key in encouraging the little bundles, which are pinched closed, to keep from opening up. 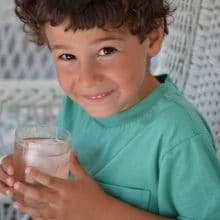 I’m diverging in technique here from what I learned growing up and from what is still done by many a Lebanese cook. They make little balls out of the risen dough and then roll out each of those to form the round that will be stuffed with spinach. It’s difficult, though, to get the dough thin enough and sticky enough this way. Instead, we’re going to roll out the dough and cut out circles using a 4” round cutter. I use the top of a canister because of all of the round cutters I have, none are the right size. 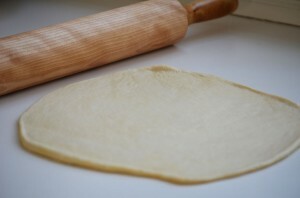 To roll the dough, use a dry work surface. There is no flour used in the rolling process. 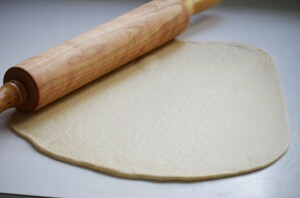 With a heavy rolling pin, roll the dough out away from and toward you a few times. Then lift the dough gently off the counter (it’s very droopy) and turn it 45 degrees. Again roll away from and toward you, working the dough out as thin as possible, less than 1/8”. 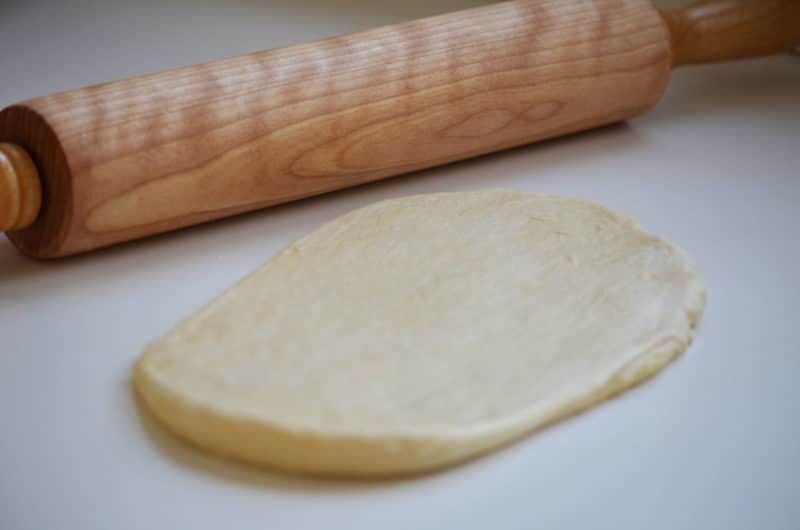 To prevent the dough from shrinking after it’s been cut, lift the dough gently off the work surface and lay it back down, in sections because it would be difficult to lift the whole sheet up at once. Then cut out as many circles as possible. Combine the scraps, knead them together, wrap with plastic and set aside to rest until you are ready to roll again. Now your dough is ready to stuff and close. I wish I could say the rest of it is easy like a Sunday morning, but I gotta tell you, I’ve been a fatayar-making machine trying to find the simplest, most successful method with a delicious result for all of us, and in the process I discovered swear words I didn’t know I had in me. Tune in tomorrow for more. 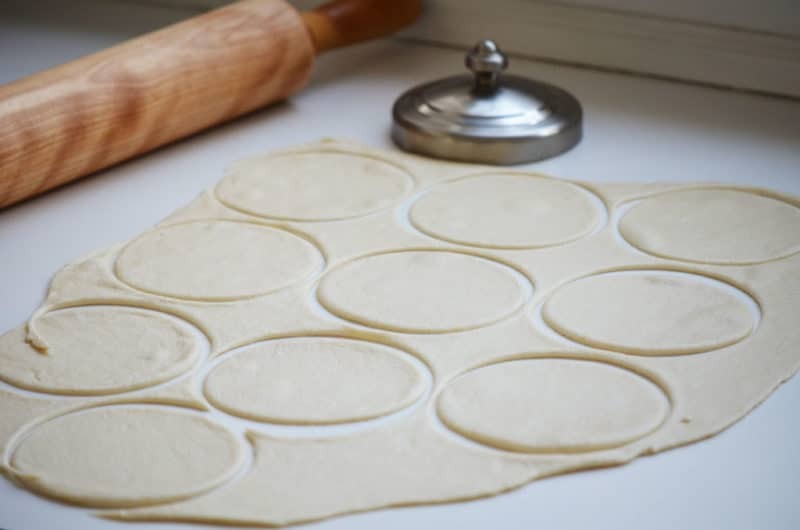 14 Responses to "Technique: How to roll dough for fatayar, spinach pies"
excellent description & ideas!!! thanks again! I don’t know what they’re called, but do you do the spinach pies with phyllo? I call that Greek! Spanikopita…I’ve done that in a sheet pan rather than as individual pies. Do you make the pies with phyllo? Yes, I cut the phyllo into strips, (after buttering 5 or six lalyers) put the filling at one end, then fold a corner to a long end then flip the triangle over—basically fold it like a flag. They come out in folded triangles. I’ve done your method also. Grandma didn’t have phyllo available so she made them like you. Maybe you’re right, I may have learned a Greek later in life. But once one learns the folding the same trick can be used with lots of fillings. Pie filling of all kinds, cheese, cream cheese “dips” type fillings, various meat fillings…..Basically anything the imagination can land on. Ah yes, I’ve made those with a delicious cheese filling. I’m sure the fatayar filling would be great in those as well! It’s great to hear that your mother cut out rounds too! 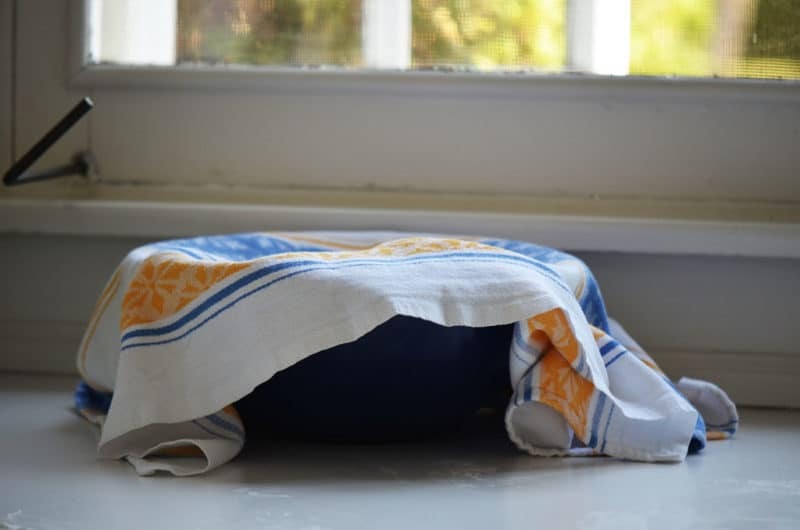 I cant wait to see the exquisite fatayers; just want to point out that I have made mine without yeast in the dough, following a family recipe, and they work out great. 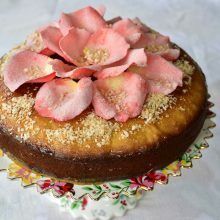 Joumana, your dough sounds really interesting–I’d love to try it sometime!! It warms my heart to have a fellow Lebanese-Lansinian/Warrier talking Lebanese food and Michigan. I feel as if it’s our little secret–that beautiful/pure Michigan thing; I can smile in understanding–no words needed. Now, since we are on the topic of dough, I have to make a very difficult request. I have no idea of the real spelling but I will muster an attempt at the phonetic spelling: Mukedabeya balls (and the soup–I have the soup recipe). Leave it to me to ask for the moon in my first post :-). For anyone who’s had this soup with the balls–it should haunt them that the ball making skill is dying–these balls have the potential to make a Lebanese “soup-nazi” out of anyone serving them! Let me just say that I did make an attempt at an appointment to learn the skill. I showed up and the person showed me the basics. I still have my notes. Here is the problem, I only got to see one phase of the process. It is probably enough, but I am the typical whiny perfectionist(I need to see the whole process) type. Since it involves flour and dough (well sort of on the dough thing), it takes time between phases to let the little nascent mini/baby balls to rise. Consequently–the internet is a perfect place to teach this skill. Don’t get me wrong—the Lebanese ladies who make the balls would probably love the company–but what are they going to do with us between the phases of letting the ball flour/dough rise? It would have to be a back and forth thing, and since my only hope is to pop in while on vacation (we live in South Carolina now) there isn’t likely to be any back and forth. …and yes it is ideal for our moms (or Sittos) to be the teachers but most of our mom’s and Sitto’s either don’t want to make them, don’t know how, or both. Thanks, at least, for the opportunity to vent; and please say hello to the beauty and cool breezes up there in cherry county. Thank you Jim for your wonderful comment. You’ve thrown down the gauntlet on the maghradbia…I know someone who makes it and I will find a way to learn and teach it!! Stay tuned my cousin. 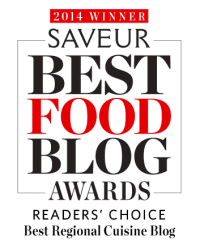 We’re blessed with your fatayer recipes! So I take it that I can’t shortcut and try to make the dough in the bread machine? I think there are 2 rises in the bread machine…..
Also, I’d like to avoid frustration (and cursing! ) during the process, so with that being said, shall I avoid making both your meat and spinach fatayer in one day/sitting?